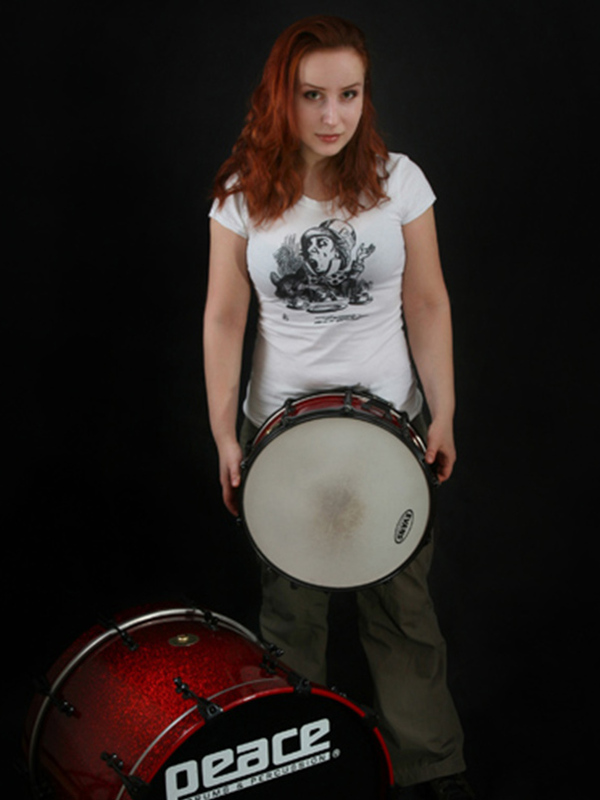 Short biography: Svetlana «SvetAmuzyka» Shumkova is the most famous woman-drummer of all country. Svetlana was born in Kaliningrad, where from 5 years she began to practise music. Since 12 years old she traveled practically all Europe with tours as a violinist. In 14 years Svetlana moved to Moscow, where she continued education in CMSH at Moscow Conservatory. Then she began to study drumming. Free, musical perception in drumming with a powerful drive - it‘s a symbiosis of academic education and «rock» school. From 17 years she began to travel with tours and to give a lot of concerts. In 2001 she joined a group «Kedy», whose clip «Fishing» was placed on all music TV-Channels of Russia. In 2003 Svetlana worked a lot with pop-rock band «Konets Filma», they had a lot of concerts in the different cities of Russia. Then she played with the best russian bass-guitarist Danii Alex C. in a project “Bassworks”, she also took part in the recording of bass video-school, and appeared on different music festivals. Svetlana’s musical activity give herself a great chance to play in the most different styles and directions - from «8 Martha» to jazz bands. Similarly practically in all projects Svetlana works as back-vocalist. Also Svetlana co-operates as a cinema-composer with a studio the name of V. Dvorzhetskiy. On the real moment Svetlana’s music sounds in the 4 films of studio, the last project was realized in autumn 2008. In 2006 Svetlana took part in the clip of pop-star A. Zatsepin, and also as a session musician worked with pop-collective "Druzya". From 2005 to 2008 Svetlana worked actively in the collective of one of the most popular rock-stars of Russia, Linda. In 2008 she took part in the presentation of new album of Linda in Moscow, concert-hall DK “Gorbunova”. During that, Svetlana started to work in a new project of Russian pop-star Irina Nelson. In autumn under the direction of Steve Orchard, producer, who was invited from England, in the largest Russian studio “Mosfilm” Irina’s english album was written down. Now Svetlana and all musicians of Irina’s project are moving to USA to start their world music career.